Yesterday was my birthday and Mr Hippy took me to a fabulous Seafood restaurant in Ipswich. It was a total surprise and we had such a lovely evening - thank you Mr Hippy! Because my birthday is July 6 that makes me a Cancerian. Yup, I'm a crabby old Crab. Anyone that knows me knows that I love anything to do with the sea - it's a bit of an obsession of mine, which is why I always buy our nautical-themed stamp sets. 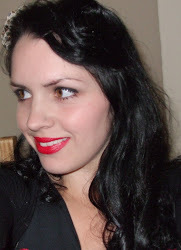 I always dreamed of being a Mermaid when I was a little girl, and used to pretend to be one when I went swimming. So our Magical Mermaid stamp set (also available in Clear Mount) really speaks to me. Inspiration and thanks go to Craftylittlepeach.com for this card - I love Lauren's designs. I have CASED as near to her original project as I can. 1. Stamp your Whisper White Cardstock card front in Tempting Turquoise using the Watercolor Wash stamp (also availabe in Clear Mount). Stamp again over the top in Pacific Point (having stamped off some of the colour first). 2. Flick some water from an Aqua Painter onto your background to create a watery effect. 3. Cut a large circle out of Whisper White Cardstock using the largest circle from the Stitched Shapes Framelits Dies in the Big Shot. 4. Cut leaves from the Everyday Jars Framelits Dies in Bermuda Bay Cardstock, again using the Big Shot Machine. 5. 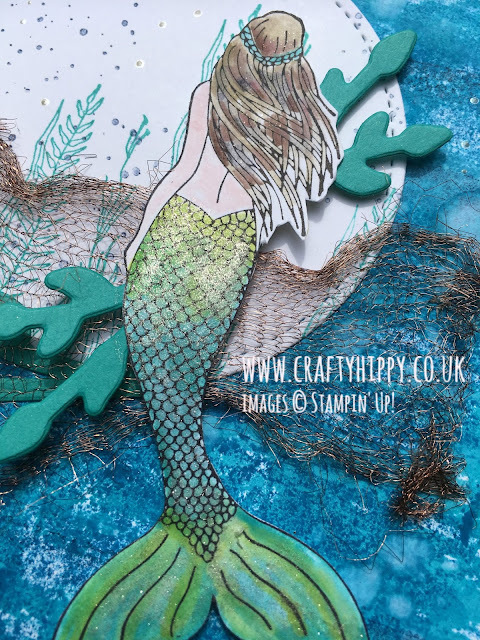 Stamp the seaweed from Magical Mermaid (link above) in Bermuda Bay and the bubbles in Night of Navy onto the circle you have die-cut. 6. Stamp your Mermaid in Basic Black Archival Ink and leave to dry. 7. Using a Blender Pen and the following ink pads colour your Mermaid in: Basic Black, Bermuda Bay, Crumb Cake, Chocolate Chip, Lemon Lime Twist (fabulous new colour! ), Pink Pirouette. 8. Glitter up the Mermaid's tail using Wink of Stella and leave to dry. 9. Fussy cut your Mermaid out. 10. Cut off a long piece of Copper Trim and run your scissors down the inside of the tube - open it out (this looks like a net). When it came to assembling this card I used some Tear & Tape to stick it down. 11. Stamp your sentiment (mine is from Thoughtful Banners) onto some Night of Navy Cardstock using White Craft Ink. 12. 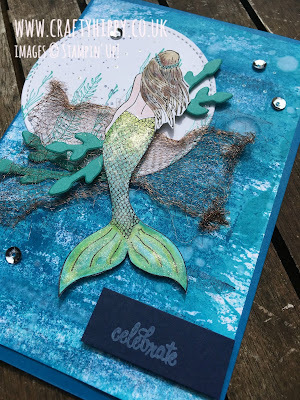 Assemble your card - I used Tear & Tape, Snail, Dimensionals and the Fine Tip Glue Pen to add some Sequins. The card base is Pacific Point Cardstock. You can view or order any of the products by clicking on their names. Let me know if you need any help with this project. Thanks so much Mr Hippy for giving me such a wonderful birthday. I can't wait for next year! 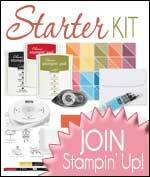 Learn more about becoming a Stampin' Up! Demonstrator by clicking HERE.